The relationship between literature and architecture is the main theme in this surrealistic video by Yung Ho Chang, that explores transliteration from an imaginary space described with words into a physical one. "The Third Police Station" animation is a puppet show based on a novel by Irish writer Flan O' Brien and titled "The Third Policeman". The space imagined by the writer is given back by the architect, through a model and the story happening inside it. The unconventional qualities of space put viewers in a multi-perspective atmosphere, and following the video they will realize how much our mindset can be moulded by space itself. The story is about three different scenerios that coexist, apparently without any interferences, inside an old house in Dublin: a police station - approximately one meter wide, hidden within the attic and the thickness of the walls of the building -, a jail in the basement - which is never completely shown in the video, but only foreseen - and the large, central space of a kitchen, used as a Chinese takeout restaurant and placed in the middle of the house. 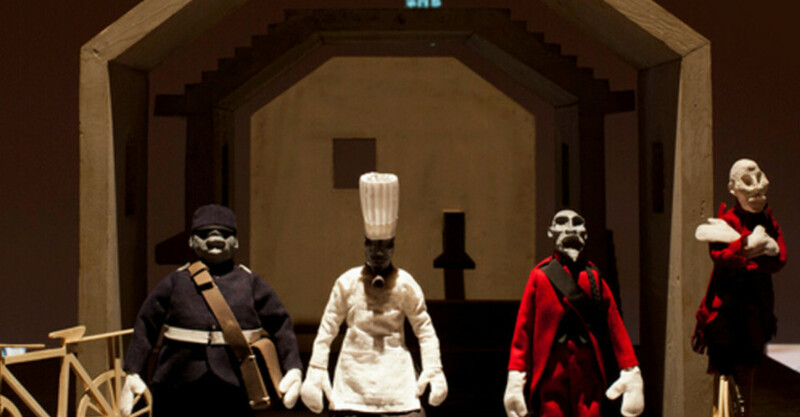 Each one of the three characters in the play - a Chinese chef, an Irish policeman and his half-human half-bicycle uncle - inhabit separately the three locations. The kitchen, the peripheral police station, and the jail are made in concrete as a set of abstract, sectional architectural relationships. The spatial representation becomes metaphor of the cultural misunderstandings and difficulties of cultural exchanges between different worlds - such as the Eastern and the Western - when the the cop and the chef try to interact with the spaces that belong to each other. The movements of the different modules of the stage, the choreographic changes in the lighting, even the incessant music in the backdrop highlight the different parts of the house as well the key moments of the plot. The overall action takes place inside the 1:10 scale model of the house, made by Yung Ho Chang for the "Tales from the Taiping era" exhibition (Red Brick Art Museum, Beijing, China; May 23 - Aug 24, 2014). By looking through the perspective window of the model, an opening on the wall separating the observer from the observed, visitors can have a unique experience of the "peepshow theatre" suggested by Yung Ho Chang.